Plans to demolish an almost 100-year-old seafront theatre have been approved. 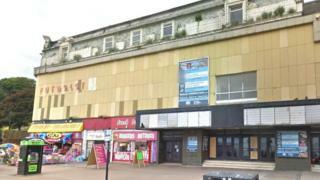 Scarborough Borough Council planners voted in favour of plans to spend £4m on demolishing the Futurist. The theatre opened in 1921 and hosted an array of famous artists, including The Beatles, before closing in 2014. Campaigners had hoped to run it as a charitable trust but the council has judged it is not sustainable as a theatrical venue. The Futurist was originally built as a cinema but the stage was extended in the late 1950s to enable it to host live performances. An entertainment venue has been on the site since 1903 when the Arcadia theatre opened. A full council meeting approved the demolition and redevelopment of the site in January and planners have voted on the details of the scheme, which also includes the stabilisation of the cliff behind the building. A number of objections to the plans were made from the Theatre Trust, The Cinema Theatre Association, SAVE Britain's Heritage and the Twentieth Century Society, who said the building was a surviving example of the "super cinema's" built after World War One. "It is a landmark local building of great historic and architectural value, and which is treasured by the local community," their objection said. More than 70 individual objections had also been made however planning councillors voted 11 to three in favour of the demolition proposals. Flamingo Land, which is a large visitor attraction in Malton, North Yorkshire, has already expressed interest in developing a new year-round tourist attraction on the site.